i'm done at 74.25 today.........nice day for probabilities!!! 3)since it was a low you add .146 is the first resistance .25 is the second. .382 is the third. .618 is the fourth. 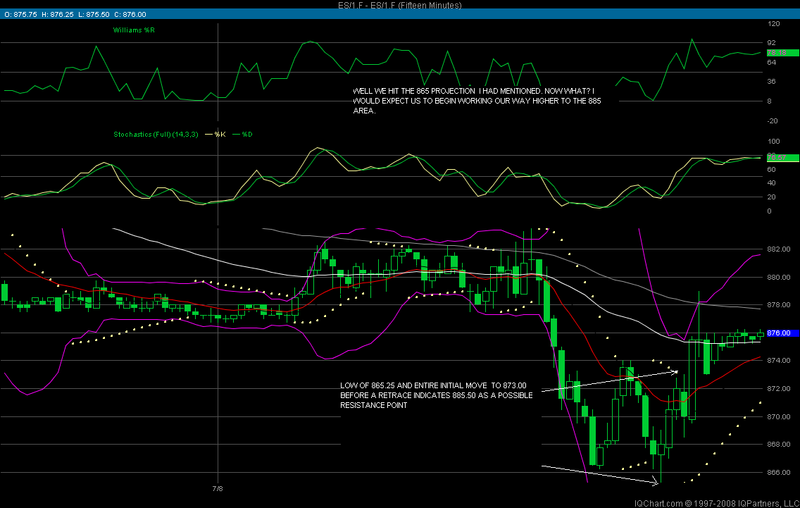 And since most markets have short term memory loss the .618 is only good on major tops and bottoms. If it was a high you would subtract these ratios. the high of the day was 883.50, in weak markets like what we had today they want make it past .146, normal corrections go to .25 and tops/bottoms usually occur at the .382's runaway markets run to the .50-1.00 corrections. Those are times of high VIX usually readings above 55. Also got a good trade off the correction of the first major low today @ 12:30. Markets got there relief rally of exactly sq root +.146 (couldn't make it past .146, that tells me that the market low wasn't in) off the low of 866.25 and any trader worth there salt knows the market moves counter trend after the morning move off the open...tat 874.75 area was another great low risk place to add some shorts if you missed the I.B. breakdown. Thanks very much for the explanation. It was very helpful that you included the numbers so I could work along on my calculator and understand the math. This is quite fascinating. Does this work out most of the time in your experience? in my world there is no coincidence to todays open and overnight trading filling in that gap......only wish I was still long for it still.......anyone see the beautiful Triple run yesterday...? It was a textbook triple!!! ,i agree with your assesment Joe!